The crash happened just before midnight Thursday on Interstate 75 near mile marker 86, east of Naples. 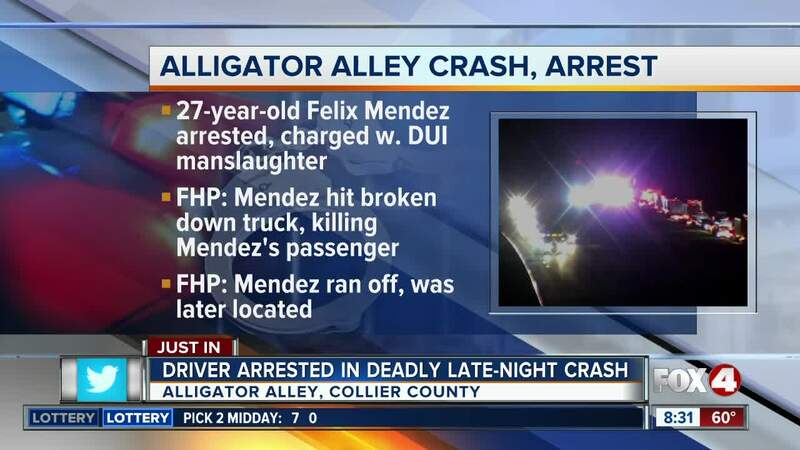 COLLIER COUNTY, Fla. -- Troopers have made a DUI Manslaughter arrest in a fatal crash on Alligator Alley overnight. According to Florida Highway Patrol, 27-year-old Felix Sanchez Mendez of Fort Lauderdale was driving in the southbound lanes when his car slammed into the rear of a box truck that was stopped on the right shoulder of the highway. A passenger in the car, a 25-year-old Fort Lauderdale man, was killed in the crash. Mendez fled the scene on foot but was found and taken into custody and charged with DUI Manslaughter, Hit and Run with Death, DUI Property Damage, and No Driver's License. The truck's driver was uninjured in the crash. All southbound lanes of Alligator Alley were shut down for about 6 hours while troopers investigated.